Teaching Good Eaters: 31 Days Challenge- Day 31: Celebrate! 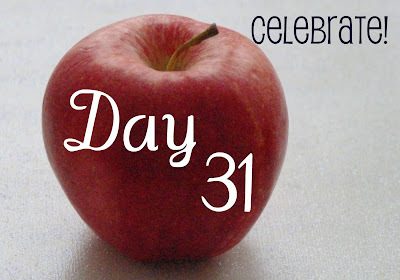 31 Days Challenge- Day 31: Celebrate! 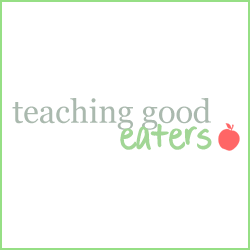 Notice that I called this challenge "31 Days of Teaching Good Eaters," not "31 Days to Good Eaters," or even, "31 Days to Better Eaters." 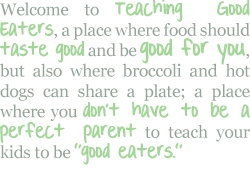 Teaching good eaters is a lifelong process. 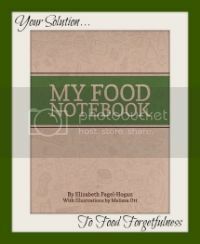 The intent of the challenge was to kickstart your family towards better eating habits- to provide some support and accountability and permission to focus on this particular aspect of your family's health and overall wellbeing. However, hopefully you completed the assessment yesterday and, hopefully, through that process, you were able to recognize some improvement in your family's eating habits. Maybe your kids made steps towards trying new foods, maybe you now have one meal at dinner time and everyone at least eats something, maybe you've cut down on the food related conflicts, maybe you've made some healthier choices in the way you shop or cook. Hopefully there has been a positive effect from taking on the challenge! 1. If your kids started a "Foods I Like," poster, see if they can add more foods to the list and celebrate all of the foods on their lists. 2. Celebrate with a special meal at home. 3. 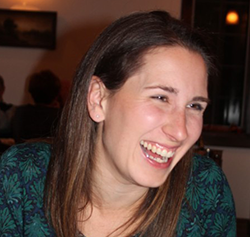 Plan a special meal at a restaurant- perhaps a restaurant that you wouldn't have chosen before because you would have worried that no one would try the food. 5. Tell family members and friends about your kids' accomplishments- in front of your kids. Thank you for participating in the challenge. If you have yet to start the challenge, or if you met us somewhere in the middle- it's not too late. The posts will remain on the site and can all be accessed through the 31 Days Challenge tab. Additionally, I will be creating an e-book so that you can have all of the information in one place and can start the challenge at any time- stay tuned! !